Yes, this is about a newly finished quilt, but first I wanted to show you my Mayday tree. It's astounding to me that it worked out to have a finished quilt, good lighting, and a blooming tree all on the same day! Spring has finally arrived here in the far north land of dog sleds and reindeer! This quilt is heavily inspired by the lovely work of others. I saw a quilt by Nettie of A Quilt is Nice, and knew immediately that I was going to make something similar to manage my overflowing scraps. Of course, it ended up looking completely different, but that's a good thing, right? This is one of those quilts that are just so fun to make. Each strip of color is about 13" tall, so the finished quilt is around 45"x50". This is a great size for a toddler, since it's slightly larger than most of the baby quilts I make. On a last minute impulse, I bound it with this Dr. Suess black and white stripe. I was worried that it would overpower the quilt, but I like it now. In fact, when I asked my husband what he thought, he said he liked the black and white border. For the quilting, I did a big circle design. This is another thing that I've been seeing and loving on other quilts, and just had to get it out of my system! I somehow thought that this type of quilting would be hard to get right, but I think it ended up being so easy! I started out by drawing the design for the first few rows and using my free motion quilting foot, and then used the guide on my walking foot to work out from there. It's so pretty! Love the scraps and circular quilting. oh man, I love this! YOu have motivated me to get working on mine. The black and white binding is perfect. I thought about doing grey, but I really like the black and white. I just LOVE everything about this quilt, Jo! It looks great! 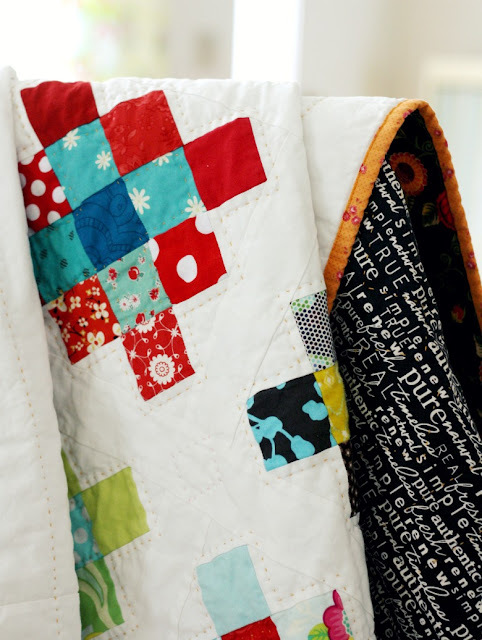 What a fantastic fun way to use scraps without the quilt looking too mixed up. The quilting and binding work well too. Omg I love it! Especially the quilting! Everything is beautiful, great job!! Gosh! I always love your quilts. You are a very talented lady. Bwah! I lOVE that quilting! I love that quilt! The colors make me feel like summer might show up soon! Gorgeous! Did you create a block or totally do this one improv? Can you tell us a bit about your process? Please??? Beautiful quilt. Love the bright colors, the black and white binding, and the way you have quilted it. Great job! I love that quilt! Especially the quilting in a circle! I love the rainbow effect on this one....and the quilting! Just beautiful! Shut the dog gone door!!!! You have done it again! Just love it to bits! It's beautiful. It's great! I agree, the black and white border is perfect! I love the way you have used bands of colour. The border must be perfect - I didn't even notice it until you pointed it out (and that means it doesn't draw my eye away from the quilt). I love this! The rainbow is so pretty, yet a bit more subtle, which I really like. Somehow the circle quilting and the black and white border just match so nicely. What a darling quilt, Jolene!! And isn't it lucky that the sun came out? I just love it! I like how some strips are placed horizontally, it adds a lot of interest. wow, so pretty! that first picture is just beautiful! i love the quilt i love the quilting i love the binding so much! it is very pretty! I love it! Especially the circular quilting. I love love love this quilt! It's just gorgeous. And I'm a bit partial to the strawberry print. I'm using the same print in the quilt I'm working on for my newborn daughter. Might have to get some more for the stash. Thank you for sharing--as always. Love your quilting. Jolene I just love it! so happy and I love the circular quilting. It's great. You are a constant source of inspiration!! Awesome. I so envy your excuse (shop/reason) to make quilt after quilt after quilt. I also agree that the binding was an excellent choice. And the quilting too. I've been wanting to do that! Wow, what a gorgeous quilt. I love the stitch work and the color combination. The Binding is just fun. I just love that quilt! wonderful, the binding, the piecing and the quilting. so fun to look at. Jolene, I wanted to share with you, some time ago, I liked your quilting and posted a picture of it on Pinterest. Since then, almost daily someone has repinned your quilting design. I posted the link to my Pinterest page so you could see some of the comments. There have been +107 likes, +612 repins since I pinned your design to someday do myself. I love your quilting.